I’ve never been to Nantucket, but envision it as a place firmly rooted in its own complicated history. Which means I do definitely want to go there. 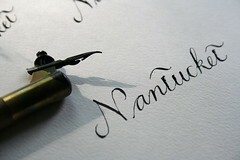 The subject of this letter “N” is not so much Nantucket the island as it is Nantucket—New England—Needlework. And perhaps the image has hinted at the subject that underlies the others: American samplers. Letterforms, pens, needles, fiber, tradition—all come beautifully together in samplers, embroidered cloths that demonstrate skill in needlework, especially in stitching alphabets. 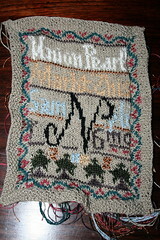 So my letter N is a small project knit in the style of needle-stitched samplers. Although knitting and embroidery (especially cross-stitch) have much in common, they seem to operate at different scales and with different fundamental concerns. 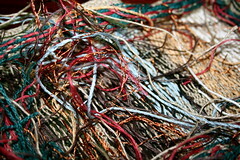 While knitting is architectural, mathematical, constructive, embroidery is fine, without visible guidelines, ornamental. 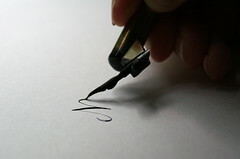 I wanted to explore their common features and celebrate two time-honored forms of needlework and penmanship. Although I tend to think of samplers as American, they are not, of course. Samplers were made all over Europe —particularly in Spain and England— for centuries before the Mayflower brought Myles Standish to this continent. 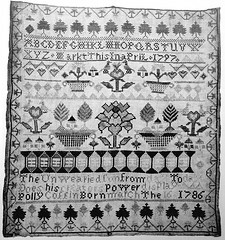 Initially, needlework samplers were, like knitting samplers, containers of information— catalogs of stitches. As written messages began to appear as a standard element, it was clear that this medium had become a gentile occupation for privileged women. Only the wealthy could afford to teach girls to read and write. The strong Quaker presence in Nantucket from the late eighteenth-century and continuing for about a hundred years assured that young women were educated. Enough samplers survive to demonstrate styles set by Nantucket educators. 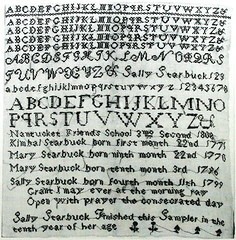 In general, the heyday of Nantucket samplers (say, from about 1790 until about 1815) produced samplers that emphasize letters rather than pictures, messages more than motifs. 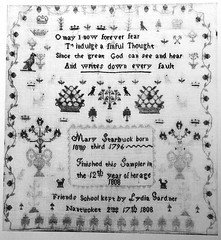 The one recurring motif, the Nantucket tree, seems to have represented some kind of a pine tree, and appears across the bottom row of Mary Starbuck’s sampler (1796, left; Nantucket Historical Association). * “6 mo.” is the Quaker term for the month of June. 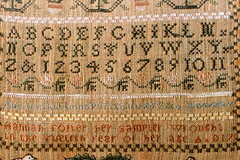 Often, written messages continued from line to line, whether or not the word or sentence broke in the right place, which is why the word, “sampler” stetches from one “row” to the next. 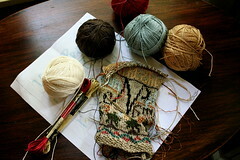 Borders are moss stitch, which flattens out after blocking to look like basketweave, also a reference to Nantucket. Sherri Federbush, “Journal of Eliza Brock” Historic Nantucket (July 1982): 13-17. Julia Fein Azoulay, “Reading into History: Susan Boardman’s Nantucket Embroidered Narratives” Piecework (July/August 2004): 34. Elizabeth Shure, “Waiting, Working Women of Nantucket Island” Piecework July August 95: 40. Carpenter, Charles H., Jr., and Carpenter, Mary Grace. The Decorative Arts and Crafts of Nantucket (New York: Dodd, Meand & Co., 1987). 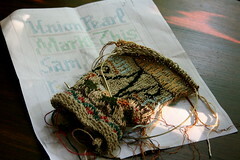 Frances Faile, “ Caring for Old Samplers” Piecework (Nov. 1993): 12-13. More about the pattern, for ravelry members. Another fascinating piece of writing. Thank you. Too clever!!! I love the N, but no surprise there. Your piece about Nantucket samplers was very interesting. 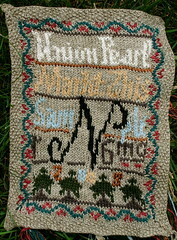 One of the first pieces of needlework I did was a sampler reproduction. This post was a wonderful reminder. 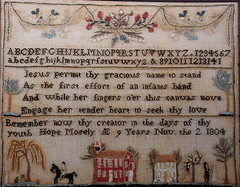 I was especially fascinated by the sampler as legal document bit. I'm really enjoying your blog and exploring the links. Your knitted sampler looks wonderful - I particularly like your colour/yarn choices. I've been reading these abecedarium posts with such pleasure and realized that I hadn't written my thanks for sharing. You warm the cockles of my heart. OK, i just saw your questions and answered them :) thank you for wanting to know me. Oh, very cool! 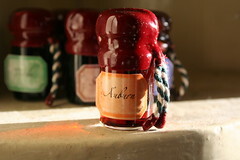 I love the shot of the back of the sampler too. What a clever idea for the letter challenge! 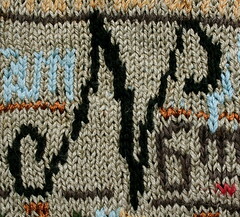 I ran across your ampersand hat on Ravelry only to discover you had even more fabulous stuff! These are all the very beautiful and attractive designs which are too gorgeous and an awesome as well.